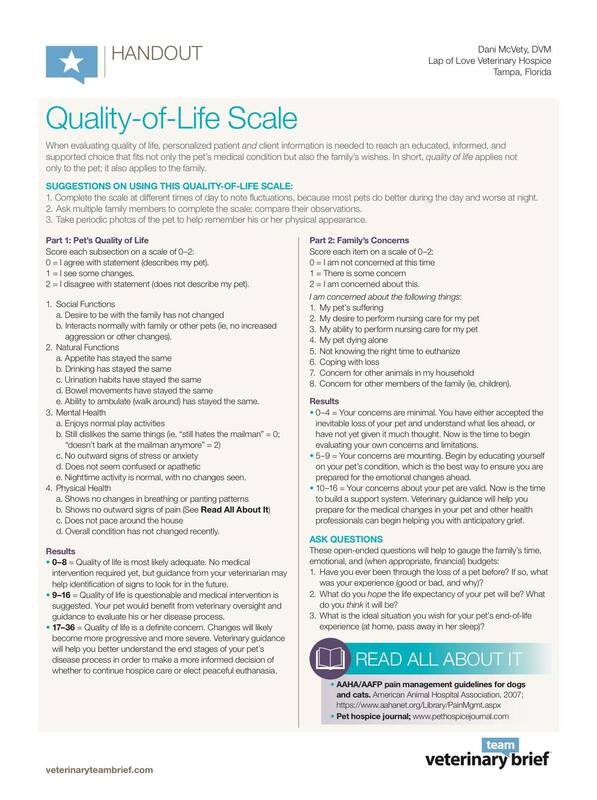 I have always been a “quality” over “quantity” person. I haven’t really explored the reason, but I suspect it has to do with how often I am around animals, observing how “in-the-moment” they are. I eye their mindfulness with intense jealousy as this is definitely a struggle for me (so many to-do lists going on at all times!). When you watch a cat stretch in the sun or a dog tear around the yard in the leaves, it’s hard to imagine that they would trade 7 bad weeks for 7 more good days. But, of course, I don’t know that to be true. Modern veterinary medicine complicates things. I am amazed at what we can do (radiation, chemotherapy, transplants) but it renders decision-making complicated, often adding layers of guilt for testing and treatments not pursued. I am grateful for the years of experience that has allowed me to find peace in this process for my own pets. I was almost shocked at how little (to some) I did for my cat after diagnosing a lung tumor. She was miserable (losing weight, not eating, lethargic) and I had options- biopsy, lung lobe removal, chemotherapy. In my mind, it wasn’t what I wanted for her. My heart IS STILL broken that I lost her, but I know that she had the most loving family she could ask for and she was with me each and every day and I held her as we said goodbye. For me, that was right. Before saying much more, I think it is important to emphasize that no one should have to choose to say goodbye. 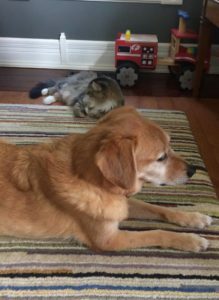 Though dying can be a very long and unpredictable process, I have never felt that anyone should feel pressured to pursue euthanasia for their pet. 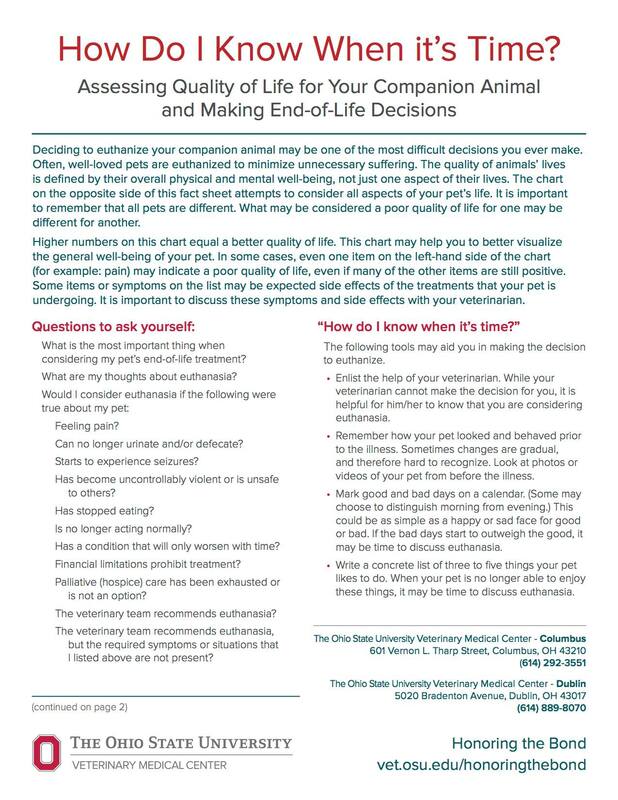 Many hospice options are available in veterinary medicine and that is a totally appropriate path for many. My biggest fear was Holden hurting so much that he would react poorly to the boys. That dog was amazing for my sons. I was afraid of dogs until I was 11 years old (that’s another story!) and I don’t know exactly why. The statement “Dogs and kids” actually makes me pretty nervous because I know how it can go wrong. I never wanted to put Holden in a position where he had to tell the boys to “back off”. The day before we said goodbye Holden yelped out twice when being petted by my husband. It made me pause even though I know he has always been pretty sensitive. 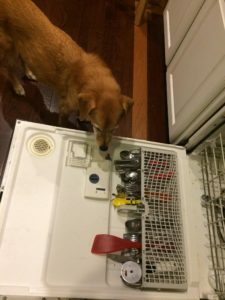 I knew for sure when I had the dishwasher open and he didn’t lick the silverware. I knew. And it really really hurt. The phrase “you’ll know” has definitely crossed my lips many times when discussing the end of life with clients and for the most part, I feel it’s true. The most challenging situations are when family members aren’t in agreement. There are several good resources online for making this a more objective assessment. 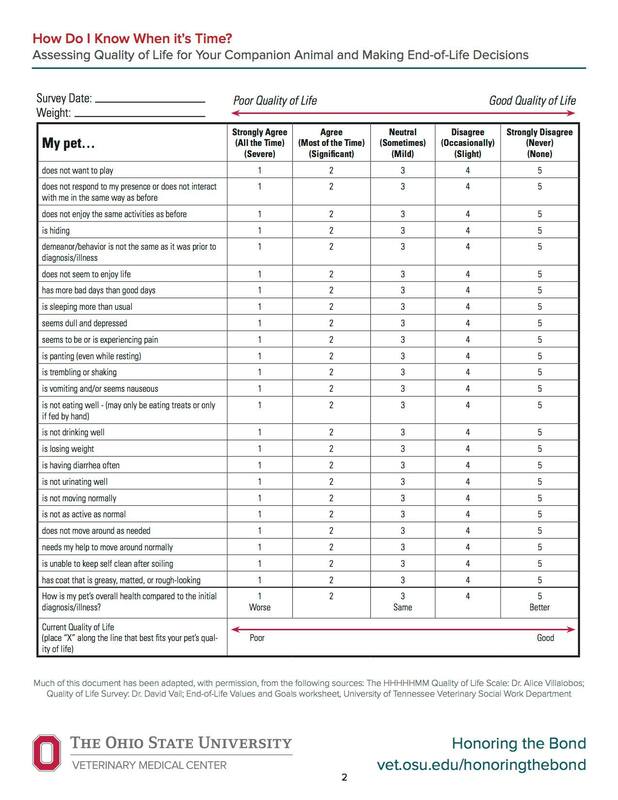 I find that picking 3 things an animal enjoys (preferably pick them when they are well) and when they are not doing them you can see that their quality of life has declined. As with all things that challenge our hearts, there are no right or wrong answers. The choice to say goodbye (and when) is definitely personal. Stay tuned for the story of our actual goodbye.